One glance and you’ll know that the Real Mallards are destined to be in hunting rigs for years to come. Drawing on our years of field and manufacturing experience and the input of other waterfowl hunters, we loaded every feature we could think of into a 7 pound package of silhouette awesomeness. Making them Pro Series II means our patented non-reflective surface is on both sides of the decoy. 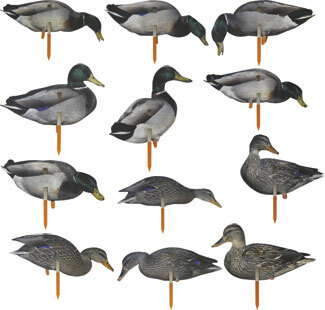 Totally new artwork and with 12 different poses, they are sized 30% larger than our old Mallard decoys. For better field visibility and realism they are packaged with 7 Drakes and 5 Hens per dozen. Of course, our color matched stakes are included.